The thyroid gland, the largest of the endocrine glands, is located in the neck just below the thyroid cartilage of the larynx . It consists of two lobes, one on either side of the trachea, joined by a narrow band or isthmus. It is composed of numerous hollow ball-shaped follicles with small, interspersed clusters of parafollicular cells. Follicle cells concentrate and attach iodine to the amino acid tyrosine, producing two forms of thyroid hormone (TH): thyroxine or tetraiodothyronine (T 4 ), and smaller amounts of triiodothyronine (T 3 ). Manufacture and release of these hormones into the blood is regulated by thyroid stimulating hormone, TSH, from the pituitary gland. The major effect of TH is to stimulate activity of enzymes involved in energy production through the oxidation (burning) of glucose , thus increasing basal metabolic rate. A side effect of this increased activity is the production of body heat. 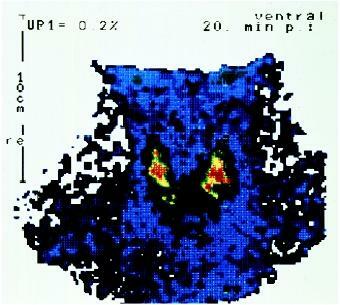 A color-enchanced scintigram (gamma scan) of a human thyroid gland. of the thyroid gland called endemic goiter. TSH is responsible for this enlargement. Parafollicular cells produce the hormone calcitonin, which lowers blood calcium levels by suppressing the activity of bone-destroying cells called osteoclasts, and stimulating calcium uptake by bones. Calcitonin is important in children, where growing bones are being constantly remodeled. It has little effect on the normal adult skeleton, but may be prescribed in nasal spray form to help reduce bone destruction in osteoporosis. Parathormone, produced by the parathyroid gland, has opposing effects on blood calcium levels. Marieb, Elaine Nicpon. Human Anatomy and Physiology, 5th ed. Boston: Addison-Wesley-Longman, 2001. Saladin, Kenneth S. Anatomy and Physiology: The Unity of Form and Function, 2nd ed. Boston: McGraw-Hill, 2001.